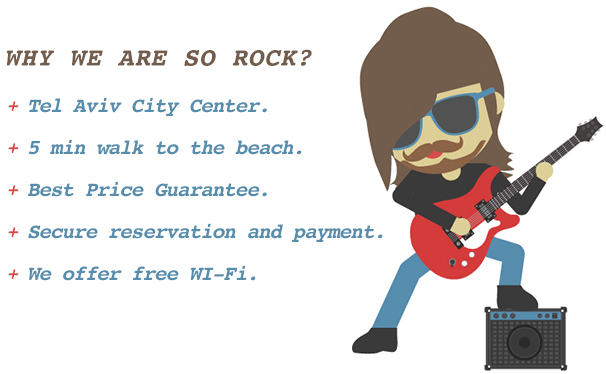 130 Rock is ideally located on the corner of Dizengoff and Gordon Street. This amazing location enables you to kick start and end your day in a stylishly comfortable apartment in the heart of Tel Aviv’s trendy Dizengoff shopping district. Colorful designer boutiques, local cafes, restaurants, and bars, an urban arts and culture scene, and of course, the beautiful beaches of the Mediterranean, are all waiting to be discovered right outside our door. In addition to our wonderful location, we have a staff of young and energetic professionals at your service that knows every inch of the city, and eagerly anticipate helping you create a unique and personalized itinerary based upon your interests, preferences. Don’t hesitate to ask them where to eat, explore or party for a memorable night out.